The Island of Phelps: Happy Halloween! Although this is technically not Gareth's first Halloween, it's the first he's celebrated. Last Halloween I was not on top of things and he got sick right before, so we decided to skip it. This year I also wasn't on top of things, but it came together better than I expected. I had been thinking we'd make Gareth into some cute, furry animal, like a lion. But then I asked Ryan his opinion and learned that cute, furry animals were boring and not cool. Ryan wanted Gareth to be the Joker. Which is a great idea except for the fact that it's not possible to find such an outfit for an 18-month-old. At least not one month before Halloween. So I was stuck worrying Gareth would have to skip Halloween again until we received a hand-me-down red raincoat with black trim. 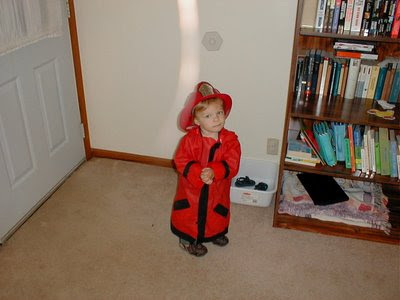 Fireman! For a few dollars I was able to purchase a plastic fireman's helmet at Walmart and the costume was complete. Not as cool as the Joker, but better than a furry animal I guess. We weren't ready in time to go out in the neighborhood, but we did make it to the multi-ward trunk-or-treat. It was very amusing to watch Gareth as I dragged him along to each car. We made it through half the cars (skipping many along the way) before he decided he'd had enough of the parking lot and wanted to run along the sidewalk instead. This was fun for a while until he tripped over another kid and scraped up his fingers. Aside from the fingers, which are now forgotten, I think he had a fun time. And, amazingly enough, he even kept his costume on the whole time we were there. Aww! Wish I could have been there. We went to a silent film - 1925 Phantom of the Opera. It was lots of fun! But Gareth is delightful looking. I can hear the feminine hearts melting all the way from here. It's making a weird sloshy sound. He's a psycho escapee from an insane prison island, retaliating after years of torture, etc. Ah well. But for Gareth, yes, my heart sloshes. Yes, Ryan and I actually saw the Lon Chaney Phantom while we were there. I love the silent films! Lon Chaney's Phantom played here on Halloween, too, with a live organist. My piano teacher used to play for the silents. I remember those red plastic fireman hats. Gareth's grandpa and great-uncle Brent had them one year.